As in any city, there are many ways to get around Copenhagen. It is quite small, 34 square miles and about half the size of Richmond, which makes moving throughout it pretty simple. Unlike Richmond, however, very few people choose cars as their primary mode of transportation. Danes prefer two wheels to four, and bike more than anywhere I’ve ever seen. They also walk a fair amount and take full advantage of their great public transit system. I have found Copenhagen to be quite navigable and thought I would give a breakdown of the different modes of transportation available to residents here. 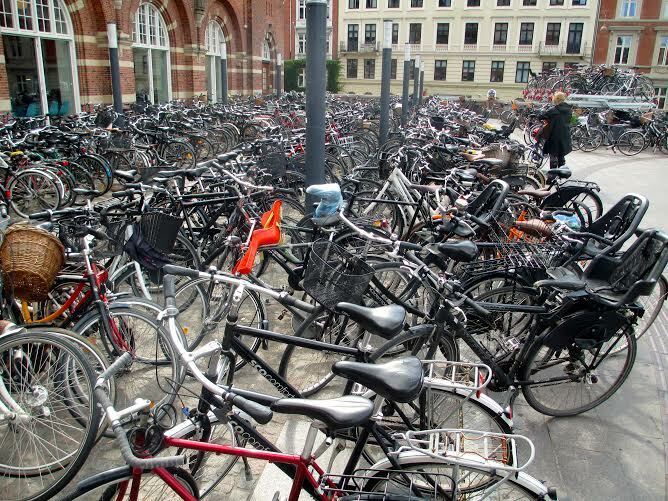 Denmark is famous for its biking culture. Before I came here, people told me that everyone bikes and they bike everywhere. I took this note in passing and greatly underestimated what they meant by the word everyone. Danish businessmen and businesswomen bike in their suits to and from work. Women bike in heels and stylish dresses. Children bike behind their parents on small plastic tricycles. People even bike to go out at night, which is one thing I actually might advise against. The weather hasn’t gotten too wintery yet, but I’ve been told people won’t even let driving rain and brutal temperatures keep them off the bike paths. 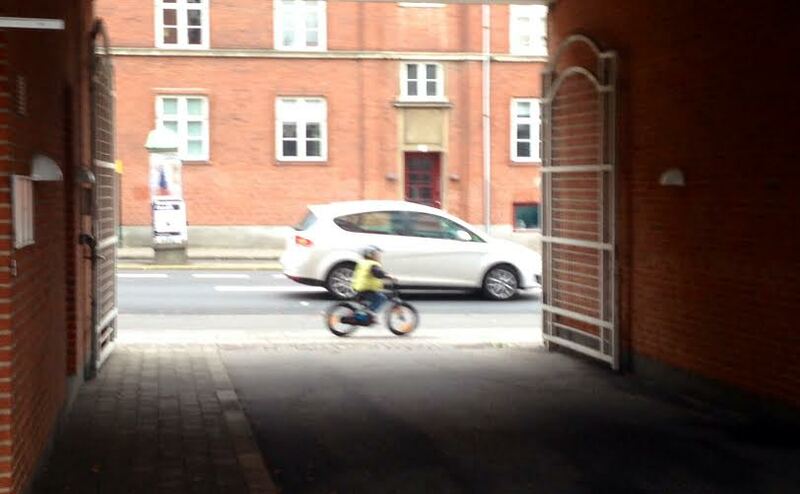 A tiny boy riding a tiny bike outside of my dorm. There’s a school or kindergarten right next door so I see lots of children around drop-off and pick-up times. Sorry the picture’s a little blurry! Hopefully this will give you an idea of what I’m talking about. So. Many. Bikes. On that note, I’ll add that the infrastructure of the city completely allows for this bike-obsession. Bike lanes run parallel to every street and they even have their own separate traffic lights. There are smooth ramps up stairs at metro stations to make it easier for riders to bring their bikes along too. 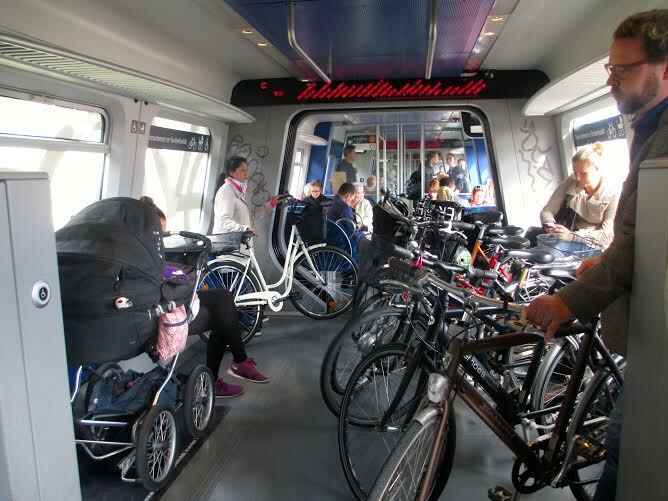 At any metro stop or train station you’ll see upwards of a hundred bikes and the trains themselves have cars where you can actually “park” your bike and find a place to sit. Biking is a good way to save money on a car or public transit, and it is also popularized for being an environmentally friendly way to get around. A parking station for your bike on the train. There are different cars where bikes are allowed and not. My take: If any of you readers follow me on social media you might already know that I bought a bike upon my arrival to Denmark. I went to a few bike shops and worked my negotiating magic before finding a great deal with a woman through a Buy-Sell-Trade Facebook group. I named my bike Gwen and, I’ll admit, became a little obsessed. 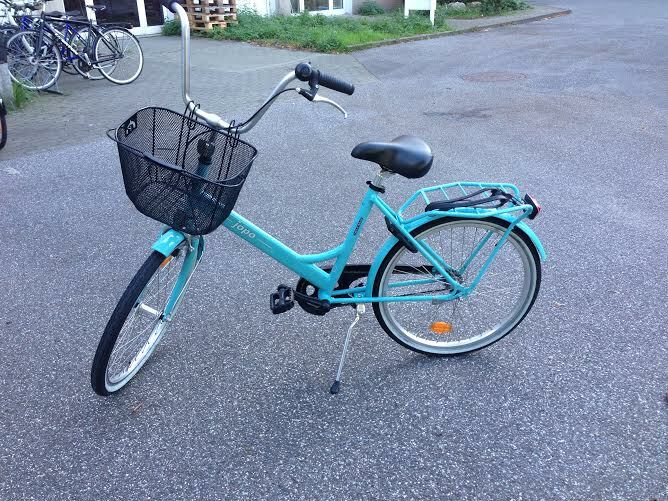 I would recommend that anyone staying in Copenhagen for a semester or longer buy a bike. Economic reasons aside, having one has been an amazing experience and has made me feel like I’m really immersing myself in the city’s culture. It’s easy to bike to class, to the gym, and to friends’ places and it gives me a much fuller view of the city than I ever would have from a metro seat. I’ll spare you the cliché of talking about the wind blowing through my hair and how freeing it feels, but take my word for it. This is my beautiful bike Gwen! (Please withhold judgment of me for naming her. Like I said in the introduction, Copenhagen is small, which means walking is a pretty good option to get around. It takes longer than other alternatives, of course, but if time is a non-issue walking is a great choice. Pedestrians here are different from those in the States though, in that they actually follow the rules. At every crosswalk where you see a little red “do not walk” illuminated man people actually stop—an action I rarely see or practice back home. In my experience, I will cross a street if there are no cars coming and it is safe to do so. In Denmark, however, if you happen upon a crosswalk in the middle of the night on an empty street you will likely find pedestrians waiting their turn to legally cross. Their lawful obedience is due in part to a threat of a 700 kroner ($118.86) fine if they are caught. That being said, I have only seen one police officer roaming the streets in my ten-week stay in Copenhagen so far. This leads me to believe that Danes are generally just a very respectful and rule-abiding people who enjoy a much safer, yet inefficient, way to walk. My take: I respect their obedience, I really do. I just don’t understand it. Even when I’m in no hurry I find it silly to halt my progress and wait on one side of the street when there isn’t a car in sight. Besides this, walking is quite nice here. The sidewalks are kept very clean, they are well lit, and you don’t have to worry about sharing the space with cyclists because of the expansive network of bike lanes. Like biking, walking also gives you a nice chance to take in the city and explore its personality. Public transportation in Copenhagen falls into one of three categories: metro, train, or bus. All are really easy to use and the same slip or pass will gain you access to any of the three. They’re all very clean, sleek, and modern too which makes for a pleasant ride. The options for payment differ from systems in the US by operating on somewhat of an honor system. That is, you can get on and off as you please without paying and just hope you won’t encounter a uniformed agent asking for your ticket. Like jaywalking, this system runs on honor and the threat of a fine, this one for a whopping $130. There are other options to buying a ticket each ride though, including getting a monthly pass or purchasing a card called a Rejsekort. Since I bike most places, I chose the latter option which gives me a discounted fare. To use it, I put money on the card and simply tap it against a sensor to check in and out at the different stations. With the Rejsekort, each trip costs about $2.50 where a monthly pass is priced around $55. There are other options available too, and which is best for you depends on how frequently you’ll be riding the lines. My take: I took the Commuter Rail to school every morning in high school and I have to say, the Danish network of public transit is an upgrade. I’ve also ridden the metro in Boston and New York and the system in Copenhagen is significantly nicer and more pleasant to use. As for the honor code method, I’m indifferent. Once or twice I’ve accidentally ridden a few stops without a ticket and was lucky enough not to get caught. I have friends who do so frequently and have never been stopped. That being said, I’ve been checked for my ticket about five times and an agent recently fined three friends when they risked travelling with expired monthly passes (I feel for you guys). A quick calculation shows that if I rode the metro more than fifty-two times without being caught it would be financially worthwhile in the end. I’m smart enough to recognize though, that those odds are not ever in my favor and I pay for my rides. There are far fewer cars in Copenhagen than you would expect to find in a city, and that’s because of their unbelievable expense. There is a 180% sales tax on cars. Let that sink in. Furthermore, gas prices are astronomical. If you think prices in the US are bad, I would think again. A gallon of regular gas in Copenhagen will cost you about $8 compared to $3 ones in the States. Considering this, most cars you do see are tiny. There are more hatchbacks than anything else and it makes me think my 2008 Scion xD would fit in great over here. As far as taxis go, they exist but aren’t frequently used. You can imagine how expensive fares would be and they’re relatively unnecessary when the metro runs 24 hours a day. 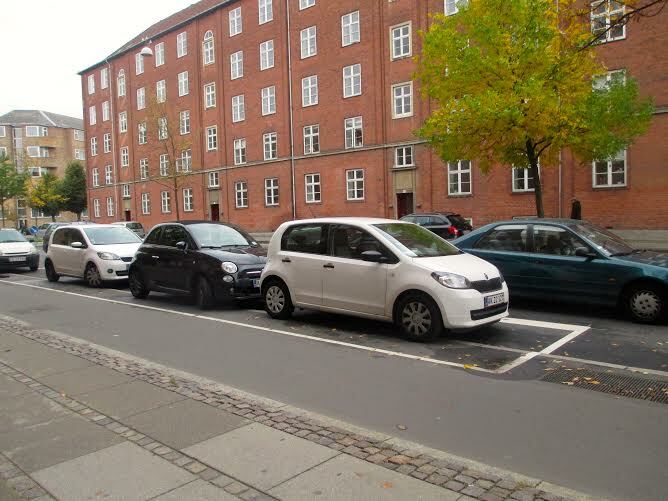 The cars in Denmark are very small compared to most you see in the United States. My take: I’ve been in a car once since arriving in Denmark and that was when I left Copenhagen to visit a friend in the city of Aarhus. She was borrowing her parents’ car for the week so we made a small trip instead of walking to the bus. Other than that though, I haven’t used a car and also haven’t missed them. Taking a taxi never even crosses my mind considering they are expensive even in the cheapest of cities. I like the lack of dependency on cars though as it provides me with a polar opposite experience than what I’ve had growing up in a suburban area. I’ve always been very reliant on cars for getting around and I’ve enjoyed becoming familiar with other alternatives. If you ever visit Copenhagen, I have a few tips for you. After you fly, do not take a taxi from their airport because it will be expensive, I assure you, and the metro conveniently leaves from inside the airport. Metro stops are prevalent also so I would save the money you’d spend on a taxi to buy food or get a nice drink somewhere. I would also suggest renting or borrowing a bike on your trip because it will help you to get around efficiently and give you a taste of the Danish way. This breakdown should help you understand how to get around this amazing city, and now you should all visit so you can try them for yourselves! This entry was posted on Monday, October 6th, 2014 at 1:17 pm and is filed under Diana in Denmark, Fall 2014. You can follow any responses to this entry through the RSS 2.0 feed. You can leave a response, or trackback from your own site.